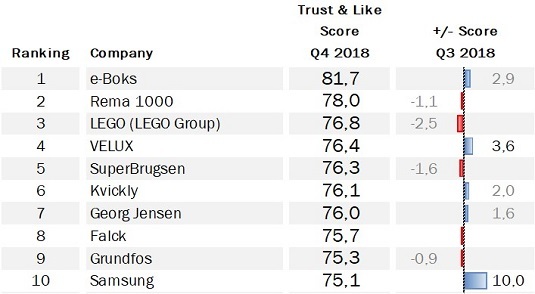 At the end of every calendar quarter, we have the pleasure of calculating the quarterly Trust & Like Score given by the Danish public throughout the quarter to the 100 companies we monitor on a daily basis in Denmark – and publishing the resulting reputation ranking. But January brings with it the bonus of calculating the full annual scores and looking at the winners and losers of the preceding year – and how reputations have evolved throughout the year. 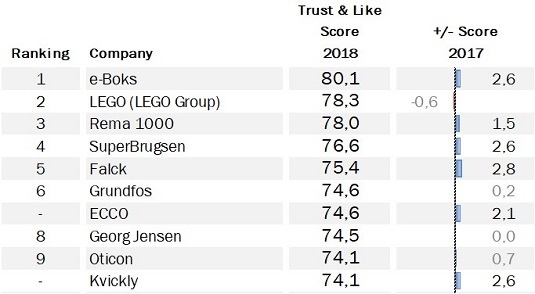 We did the same this year and are proud to present the Top 100 list of Denmark’s most trusted and liked companies in 2018! This time we turned to our CEO, Shahar Silbershatz, to shed light on the results. As someone who has closely followed the changes in companies’ reputations in Denmark and abroad for over 10 years, Shahar has some interesting observations on this year’s results. Q: First off there’s something we need to get out of the way – every time Caliber publishes its Top 100 ranking, we get questions about the inclusion of e-Boks and surprise at its top ranking. Why is it included and why do you think it does so well? A: This is indeed a question I get a lot – and I think it comes from the misperception that e-Boks is a public service rather than a private company, and a highly prominent one in the Danish business world and in terms of public awareness, which is why it’s included in the 100 most prominent companies’ list. This is probably also the reason it is so trusted and liked: people see it as a reliable service, that reflects the innovation the country’s public services – and importantly, one they don’t have to pay for. When the time comes that people realize e-Boks is a private company, and it will, and when the government opens up this service to competition, which it will – the company may find that it needs to fight much harder to maintain its public trust and affection, like its parent company PostNord (ranked very last in the Top 100 list) found out many years ago. Q: How do you explain the success of Rema 1000, who reached the 3rd place in the list for 2018? A: This is another interesting phenomenon – it’s the only non-Danish company included in the top 10, and has consistently done well in the last couple of years. The Danes seem to love the Norwegian discount retailer for its wide offering of organic products and sustainable supply chain. But critically, it’s being applauded for a superb shopping experience, probably helped by the fact that the franchise model means stores are owned by their managers and service is therefore better. At the same time, this is also part of a general trend in Denmark of improving reputation within the food retail sector – all 11 players included in the Top 100 have improved in score from 2017, which is remarkable. Even more remarkable is the fact that 3 of the top 10 companies are food retailers, showing a strong performance by the sector as a whole. Q: What else do you think is worth noting about the top of this reputation ranking? A: Well, other than the exception mentioned above, it’s interesting to see that nearly all top-performing companies are Danish. If we look at the top 20 – all of them are iconic Danish companies except for Rema 1000 and IKEA. It’s clear that the Danes are proud of their home-based companies that succeed globally. But you can also see that this strong reputation is not guaranteed – it can be lost when issues emerge (as was the case with Danfoss, which dropped significantly from 2017, and A.P. Møller – Mærsk, which is down at #30). Interestingly, the Q4 ranking reveals another foreign company that made it to the top 10, and a surprising one: Samsung. A: Good question! I think this can be better understood against the backdrop of what’s happening to Big Tech – companies like Amazon, Google and Facebook have suffered great reputational declines in 2018 in Denmark, and worldwide, due to scandals from data privacy to tax avoidance and abuse of power. Those 3 are among the top 10 fallers in score from Q4 2017 to Q4 2018, which says a lot. Samsung is seen as different from them since it hasn’t been embroiled in any tax or data privacy scandals, and as such gains in popularity. On the other side, competing smartphone providers are nearly all Chinese companies, who these days are heavily scrutinized for their links to the Chinese authorities (like Huawei), which again leaves Samsung as a preferred alternative. Then of course there are things like the new Samsung foldable phone and other new products that reinforce Samsung’s reputation for innovation. Q: Are there any other interesting stories among the big risers and fallers? A: Indeed! There are 2 companies who did remarkably well in recovering from different crises that befell them in 2017 – Nets and KMD, the two biggest risers from 2017. Both worked consistently and diligently to listen to their stakeholders, focus on their operations and tell good stories about their value to customers and society. On the flip side, there are two clear losers this year: Danske Bank and Nordea, who keep disappointing the public by living up to the sector’s reputation for perceived greed and corruption. Those 2 companies are now ranked #99 and #100 in the Q4 list. At the same time, Nykredit has done well this year being the 3rd biggest riser in score on an annual basis, so perhaps the pain of some is the gain of others. Q: What do you think companies can learn from this ranking – especially those who are interested in strengthening their reputation? A: First of all, I think every company should be interested in strengthening its reputation! Our studies, and many other business and academic studies the world over, show without a doubt that a strong reputation directly contributes to financial performance, and should therefore be a primary focus area for commercial organizations. For me, what’s more interesting than the ranking itself is the identification of drivers of reputation, and we find time and again that things like a company’s perceived integrity and authenticity (or what we call the company’s character) are significantly more important than areas of competency like innovation, products and leadership – when it comes to driving trust, advocacy and loyalty from customers and employees. So the first lesson is to focus on your character, not just your competency. The other important lesson is that reputations are invariably volatile – even well-established companies can suffer reputational declines if their stakeholders are disappointed with their behavior. But the stronger your reputation is, and the better you handle such cases of disappointment, the more likely you are to recover quickly. It is therefore important to continuously track stakeholder perceptions, identify cases of decline early enough for correct and informed mitigation, and isolate activities that consistently maintain and improve your reputation so that money is spent wisely, and results can be proven. Q: Thanks for your perspectives. Any final words? A: Good luck to all 100 companies in 2019 – and see you in April for the Q1 analysis! The results are based on Caliber’s real-time tracking study that measures public perceptions of the most prominent companies in Denmark on a daily basis. The scores underpinning the ranking are based on the average responses to 2 separate questions presented on a 1-7 scale: to what extent respondents trust and like each company. The scores are then normalized into a 0-100 scale without any weighting or adjustments. The full year results are based on more than 60.000 evaluations based on 10.000 unique respondents. Quarterly results are based on more than 15.000 evaluations coming from more than 2.000 unique respondents. Both annual and quarterly results are representing the Danish population along key demographic indicators. As the data is collected on a daily basis, rather than on an ad-hoc basis as is often the case in comparable studies, results can be seen as being representative of all news and activities that occurred throughout the measured periods. All results shown in the Top 100 ranking can be further broken down along age, gender, geography and occupation.